Here is another nail art I got out too late to participate in the inLinkz. Plus I had nowhere I wanted to post my nail art back then. 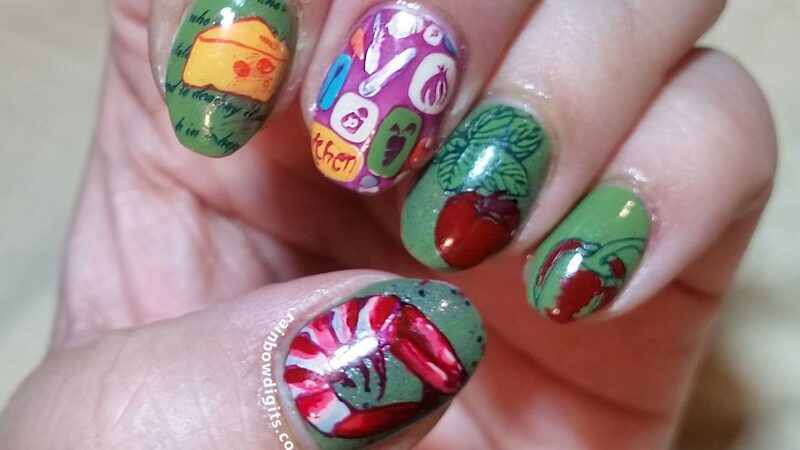 I apparently have a thing for food nail art. Whenever I see a nail stamping plate with food on it, I want it. And it doesn’t have to be from a nail plate. I’ve done freehand fruit manicures as well. Seriously need to do some sushi ones. Like…soon. Possibly swapping out what I had planned for ‘s’. Or not. But today I am posting about how ‘f’ is for Food! 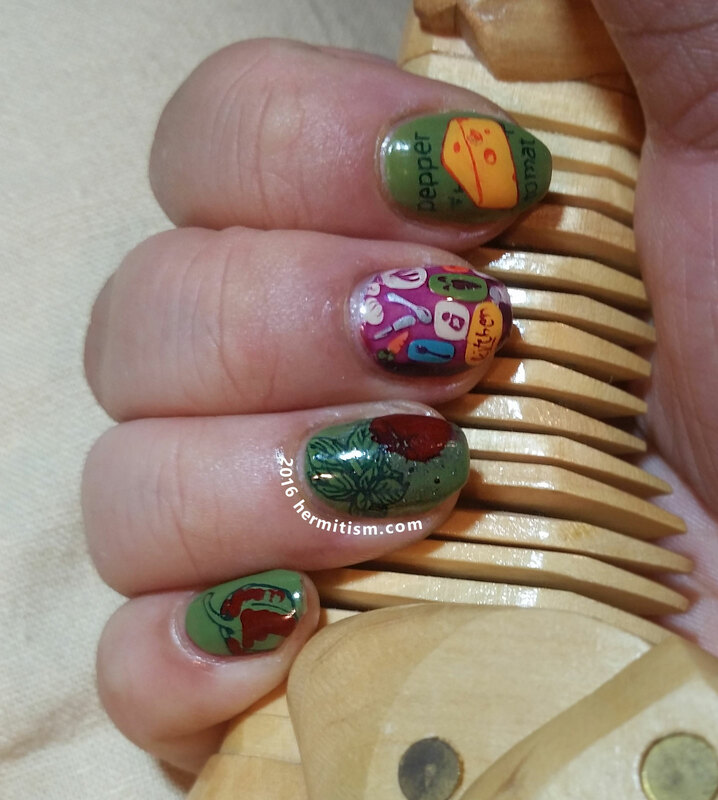 Since this pre-dates the start of this blog, I can tell you this was the most reverse nail stamping I had ever done to date. I ran out of stampers to put things on so I could color them. Really should get one of those silicon mats soon. 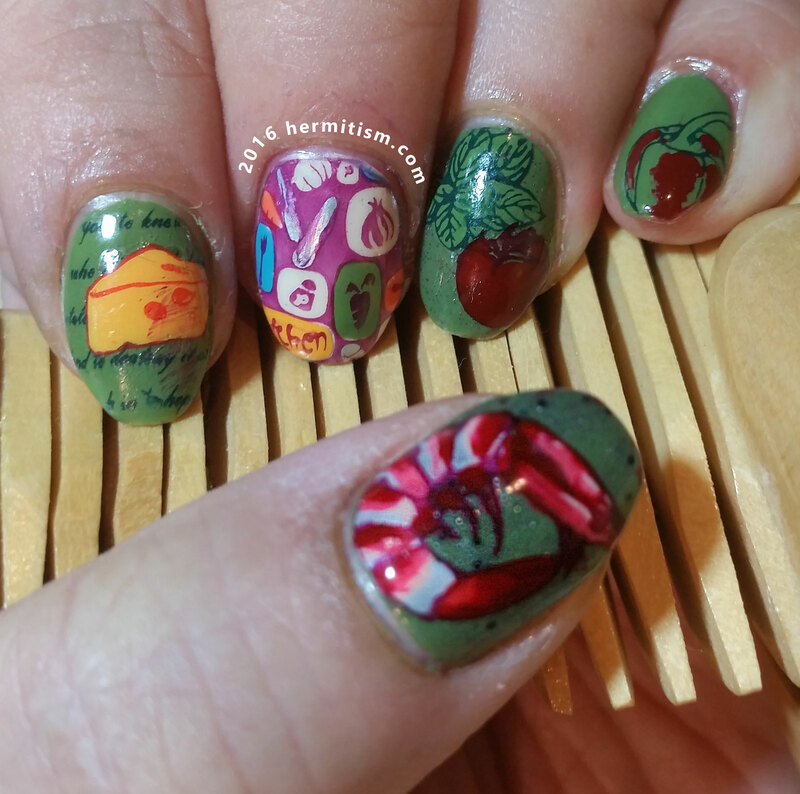 Since the shrimp was my favorite stamp, I spent extra time coloring it in prettily. Doing so made me realize I have…not much in the way of light to medium pink shades. I improvised with a Sinful Color’s jelly neon which added a bit of a day-glow element to the whole thing that I wasn’t quite aiming for. Plus my middle finger displays quite clearly why I need to buy proper stamping polishes in a few colors because what I used was way too transparent. Still. Loved this nail art and didn’t want to take it off.